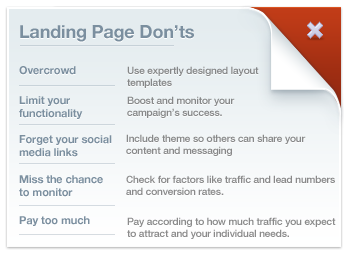 You know a high performing landing page is crucial to your online campaign’s success. You know it will channel more relevant traffic to your website. And you know that more traffic means more conversions. Time it right: Even if it means creating your landing pages yourself – and with the new Lander app you easily can – it’s essential to get them live fast enough to take advantage of market conditions. Customise your landing pages:Your goal may be more sales, more leads or more subscriptions. To maximise your page’s performance, it’ll need a dedicated layout to match. Capture data: Use conversion forms – the easier to create the better – to record the visitor info you need. Tailor your tags: Customised URLs will help boost your pages’ SEO performance and impact, and make them more memorable. Test and edit: A/B testing enables you to trial different versions of each landing page. Use real-time feedback to fine-tune your choice of layout, text, images and calls to action. Don’t overcrowd: Expertly designed layout templates help you keep your content structured, single minded and user focused. Don’t limit your functionality: Make sure your pages house the apps and analytical tools to boost and monitor your campaign’s success. Don’t forget your social media links: Include these in your layout so others can share your content and messaging, helping your campaign go viral. Don’t miss the chance to monitor: Make sure your landing page dashboard lets you check for factors like traffic and lead numbers and conversion rates. Don’t pay too much: The very best landing page creation packages offer bespoke pricing plans. Pay according to how much traffic you expect to attract and your individual needs. Follow these simple tips, and super-effective, super-affordable landing pages are within your easy reach. You’ll be amazed how your business got by without them!